The Boat Inn at Lenton is a proper local, serving a decent pint and plenty of simple pub grub to soak it up with. The pub is tucked away on Priory Street a small side road joining up to Abbey Bridge one of the main roads running past the QMC and backing on to the Priory Church grounds. Apparently back in the day they used to brew beer pulled from the well in the graveyard, but I don’t think you can do that anymore people get fussy these days about stuff like that! I was having the “Beer Battered Haddock, Chips and Mushy Peas” for £5.95 I could have had Cod but why would I when haddock is on offer for the same price? Ok so it’s not gourmet but this was decent pub grub and just the thing to fill up a hungry chap needing some sustenance. If I was here again on a Tuesday and fancied a pint and a bite I would probably have it again. In fact that first visit to The Boat Inn was enough to make me want to pop back again, this time with Alison one of myfoodhunting partners in crime, just for a bit of food, a pint and a chat. It seems to be that sort of place, nice for meeting up with mates for a beer and a spot of food at really very reasonable prices. It turned out that they had a fairly well laid out vegetarian menu which is bonus when your friend is so inclined. As an added bonus on the Thursday it was Curry and a Pint for £6.50. It was also Chilli as well but I suppose Curry or Chilli and a Pint does not have quite the same ring to it. I almost had the macaroni cheese with garlic bread, I mean that was just £3.95! In the end though that ‘Chilli and a Pint deal’ swung it when I was ordering. I had the ‘Home made chilli with red kidney beans, haricot beans, chick peas and mushrooms with rice (and garlic bread) ‘ normally that is listed at the bargain price of £4.75 but tonight I was having it with a pint for £6.50. This was another decent bit of pub grub, it doesn’t look pretty but you know what I wasn’t asking for beauty I just wanted tasty and filling. It did both of those quite effortlessly. The chilli wasn’t that spicy but it had a nice flavour, it reminded me of the sort of bowls of chilli I would get with a bit of bread at the bar over in the states, it was a little bit sweet, and a little bit tangy. I liked all the different beans in there and it was like a nice thick bowl of soup really. The dome of rice was best when you mixed it into the chilli so you could spoon it all up easily and then you could mop up the rest of the sauce with that garlic bread. Alison had the Spring rolls which was described as ‘Vegetable Spring Rolls with a Thai Sweet Chilli dip served with rice’ for the bargain basement price of £3.95. To be honest it didn’t look that great to me, but you did get a lot of spring rolls for your money and it seemed to all get eaten. I reckon that was the whole packet on the plate. The dip was spicy (apparently) and that was about all I can say, I didn’t have one to try. I liked that they had plenty of different offers on different nights as well. I really am quite keen and very likely to pop back again on Caribbean Monday’s, which I suppose means a Monday night then, Just because I see that they are doing a ‘Mutton curry served with rice and peas and a fried plantain’ for £6.95. I am pretty happy that I did make that spur of the moment decision to jump off the tram at Gregory Street to check out The Boat Inn. It is a really decent local real ale pub and just the sort of quiet spot that I love finding where I can squirrel myself away in the corner to get a pint and read the paper. It was also pleasing to find some proper pub grub at really very reasonable prices. I would much rather have something to eat in a spot like this than give my money away to one of the big chain pubs. 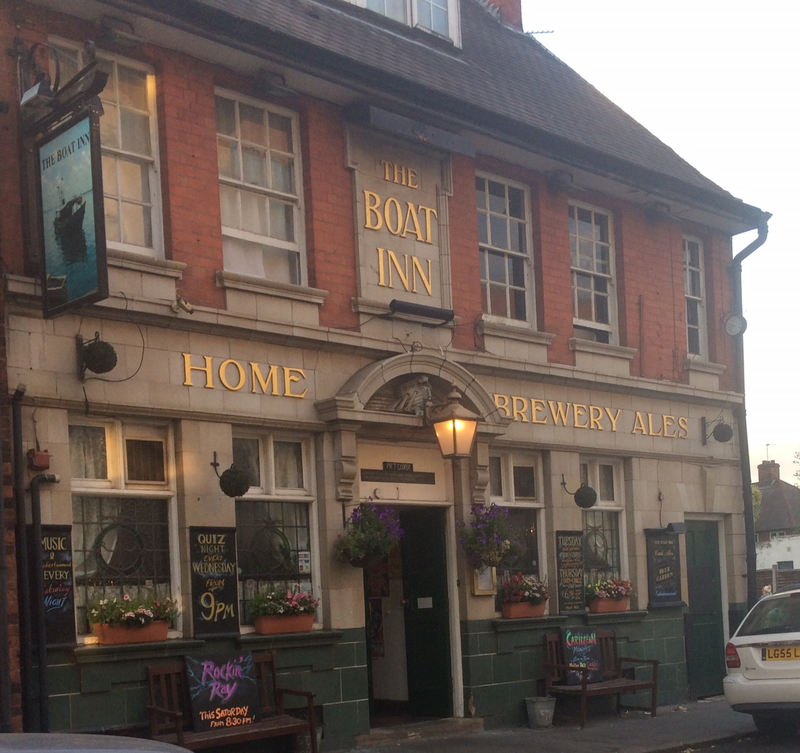 The Boat Inn is located at 9 Priory Street near to the QMC and near to the Gregory Street Tram Stop.